And you don’t need me to tell you that a huge increase in site traffic means… many extra $$$ in the bank! Simply put, blogging is the hottest new form of content, and pinging is how you let the search engines and the world know you’ve got fresh new content posted. If you do any sort of Internet marketing you can\'t possibly do without This incredible new software! It could take you years and can cost you a small fortune to figure out just the right combinations that make some magical combination of SEO keywords work – while others fall flat on their face. 1. I don’t have time to hassle with SEO, keywords, densities, and shuffling articles around. 2. I don’t want to wait 6 months. 3. I won’t pay $1,500. After extensive research, he determined that that blogs are now considered “search engine candy.” So he developed a tool, Blog & Ping Automator, that goes out and gets the very best content—either from the internet or from your site—and posts the first portion of each article into a blog entry. To be fair, let’s compare apples to apples. Blog & Ping Automator could easily sell for $800. In fact if you asked a top programmer, like my friends, to produce an automated blog and ping tool for you, you’d be charged in the neighborhood of $2,000 to $3,000, not including his expenses. So at bare bones minimum you’re getting $2,000 of the very best SEO tools at your disposal. But I’m not going to charge you anywhere near that amount or even my minimum project price. In fact, your total investment for Blog & Ping Automator is only $67! Well, it’s really quite simple. I’m a marketing guy at heart, and I know that the best way, the absolute best way, to sell anything is by word of mouth. You gotta get a buzz going. So I’m selling Blog & Ping Automator – an $2000 value – for $67 for a limited time only! Once the cat’s out of the bag and everyone’s talking about it, I’ll raise the price and start making a profit. When will the price go up? It could go up at anytime, so if you want to get in on this incredible bargain, you need to ACT NOW! And get some sleep tonight, because tomorrow you’re going to get busy, really busy! That means you can try out Blog & Ping Automator at my risk, while you see if it works for you or not. And if it doesn’t produce, I honestly want you to ask for your money back because I don’t want dissatisfied customers. There is absolutely no risk, whatsoever on your part. The burden to deliver is entirely on me. If you don’t see an immediate increase in site traffic and ad revenue, then I’m the loser, not you. It\'s easy to get started right away. Please Note: Blog and Ping Automator is a Script that must be installed on your own WebSite. If you are not familiar with this process please think before ordering. No support can be provided. Blog & Ping Automator is a .php script- that means you will need a hosting UNIX based account to install it on for it to work properly! 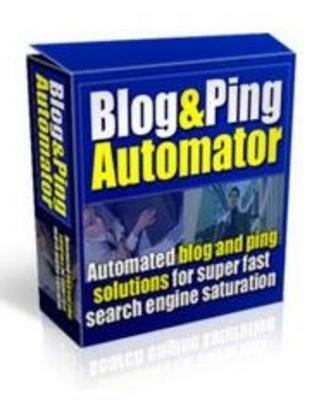 Blog & Ping Automator blog automation;website traffic 32161508 12.00 unlimiteddownload Fresh Download Available!